As African countries strive to meet the UN Millennium Development Goals (MDGs) by 2015 and plot a new development agenda thereafter, health experts are gathering evidence across the continent to make a case for a greater focus on its millions of mentally ill. Experts say investing in mental health treatment for African countries would bolster development across the continent, but national health priorities have been overtaken by the existing MDG structure, which has specific targets for diseases like malaria and HIV, placing them higher on countries' agendas than other health issues. "Everyone is putting their money in HIV, reproductive health, malaria," says Sheila Ndyanabangi, director of mental health at Uganda's Ministry of Health. "They need also to remember these unfunded priorities like mental health are cross-cutting, and are also affecting the performance of those other programmes like HIV and the rest." Global experts celebrated the passing of a World Health Assembly action plan on World Mental Health Day in May, calling it a landmark step in addressing a staggering global disparity: The World Health Organization (WHO) estimates 75-85 percent of people with severe mental disorders receive no treatment in low- and middle-income countries, compared to 35-50 percent in high-income countries. The action plan outlines four broad targets, for member states to: update their policies and laws on mental health; integrate mental health care into community-based settings; integrate awareness and prevention of mental health disorders; and strengthen evidence-based research. In order for the plan to be implemented, both governments and donors will need to increase their focus on mental health issues. As it stands, the US Agency for International Development (USAID), the world's biggest bilateral donor, will only support mental health if it is under another MDG health priority such as HIV/AIDS. Meanwhile, mental health receives on average 1 percent of health budgets in sub-Saharan Africa despite the WHO estimate that it carries 13 percent of the global burden of disease. "Mental health hasn't found its way into the core programmes [in developing countries], so the NGOs continue to rely on scraping together funds to be able to respond," Harry Minas, a psychiatrist on the WHO International Expert Panel on Mental Health and Substance Abuse and director of the expert coalition Movement for Global Mental Health, told IRIN. "Unless we collectively do something much more effective about NCDs [non-communicable diseases], national economies are going to be bankrupted by the health budgets." According to a May report from the UN Secretary-General's High-Level Panel of Eminent Persons on the Post-2015 Development Agenda, the MDGs have overseen the fastest reduction of poverty in human history. "Mental health hasn't found its way into the core programmes [in developing countries], so the NGOs continue to rely on scraping together funds to be able to respond"
Yet it also acknowledges that they have done little to reach the world's most vulnerable. The report says the MDGs were "silent on the devastating effects of conflict and violence on development" and focused too heavily on individual programmes instead of collaborating between sectors, resulting in a largely disjointed approach to health. Experts say without a more holistic approach to global health in the new development era, the world's most vulnerable will only be trapped in that cycle. "The MDGs were essentially a set of vertical programmes which were essentially in competition with each other for resources and for attention," said Minas. "We've gone beyond that, and now understand we're dealing with complex systems, where all of the important issues are very closely interrelated." In Africa, where many countries are dealing with current or recent emergencies, WHO sees opportunities to build better mental health care. "The surge of aid [that usually follows an emergency]combined with sudden, focused attention on the mental health of the population, creates unparalleled opportunities to transform mental health care for the long term," say the authors of the report Building Back Better: Sustainable Mental Health Care after Emergencies, released earlier this month. In a study published in the Journal of Affective Disorders in July, researchers in northern Uganda - which, starting in the late 1980s suffered a two-decade long war between the government and the rebel Lords' Resistance Army - monitored the impact of group counselling on vulnerable groups such as victims of sexual and domestic violence, HIV-infected populations, and former abductees of the civil war. It found that those groups who engaged in group counselling were able to return and function markedly faster than those who did not receive counselling, while reducing their risks of developing long-term psychiatric conditions. "We need to be mentally healthy to get out of poverty," Ethel Mpungu, the study's lead researcher, told IRIN. The link between mental illness and persisting poverty is being made the world over. According to a 2011 World Economic Forum report, NCDs will cost the global economy more than US$30 trillion by 2030, with mental health conditions alone costing an additional $16 trillion over the same time span. "It really is around issues of development and economics - those things can no longer be ignored," says Minas. "They are now so clear that ministries of health all around the place are starting to think about how they are going to develop their mental health programmes." As mental health legislation is hard to come by in most African countries, Uganda is ahead of most on the continent with its comprehensive National Policy on Mental, Neurological and Substance Use Services, drafted in 2010. The bill would update its colonial era Mental Treatment Act, which has not been revised since 1964, and bring the country in line with international standards, but is still waiting to be reviewed by cabinet and be voted into law. Uganda is also part of a consortium of research institutions and health ministries (alongside Ethiopia, India, Nepal and South Africa) leading the developing world on mental health care. PRIME - the programme for improving mental health care - was formed in 2011 to support the scale-up of mental health services in developing countries, and is currently running a series of pilot projects to measure their impact on primary healthcare systems in low-income settings. Research shows that low- and middle-income countries can successfully provide mental health services at a lower cost through, among other strategies, easing detection and diagnosis procedures, the use of non-specialist health workers and the integration of mental healthcare into primary healthcare systems. 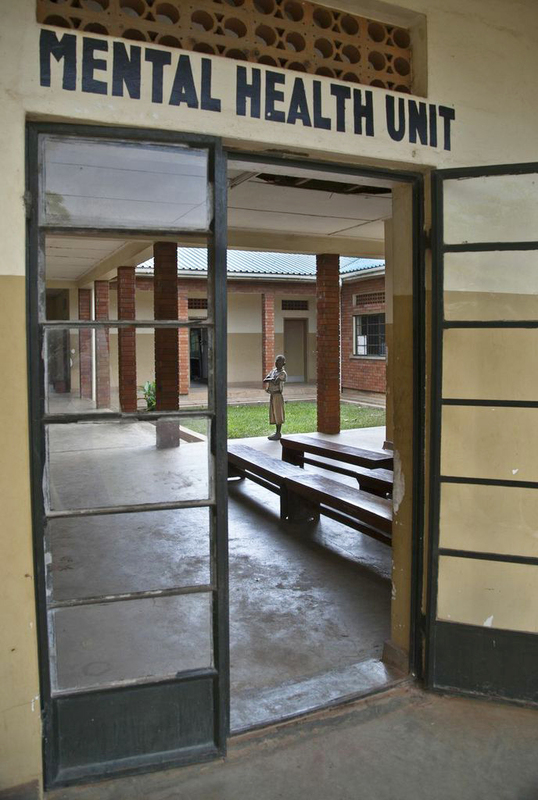 Although a number of projects have shown success in working with existing government structures to ultimately integrate mental health into primary health care, the scaling up of such initiatives is being hindered by a lack of investment, as the funding of African health systems is still largely seen through donor priorities, which have been focused elsewhere. "Billions of philanthropic dollars are being spent on things like HIV/AIDS or water or malaria," said Liz Alderman, co-founder of the Peter C. Alderman Foundation (PCAF), which works with survivors of terrorism and mass violence. "But if people don't care whether they live or die, they're not going to be able to take advantage of these things that are offered."